Fiat Flameout: Hi Ho Silver! While many gold market technicians have been neutral to slightly negative about gold in the short-term, I’ve been extremely positive. As of today, I’ve become outrageously more positive. This is the spectacular daily gold chart. I’ll dare to suggest that gold investors have behaved very well this year. As a result of that behaviour, Santa has put a beautiful bull wedge breakout into everybody’s Christmas stocking! The near-immediate price target is $1310, but $1360 should also be hit during what looks to be a very positive Chinese New Year season. 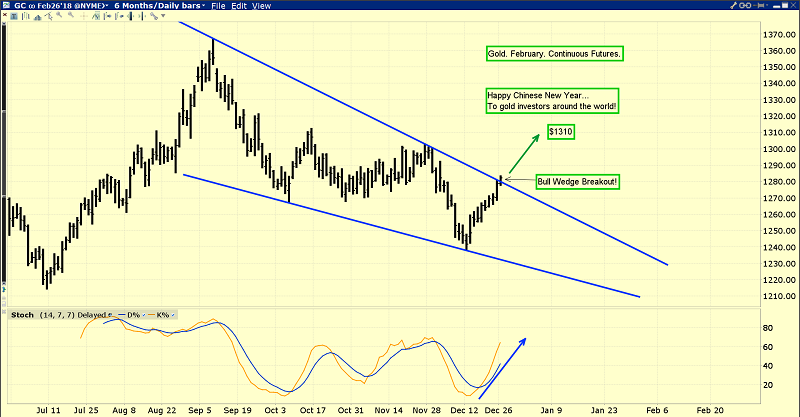 Do the festivities extend to gold stocks as well? Absolutely! 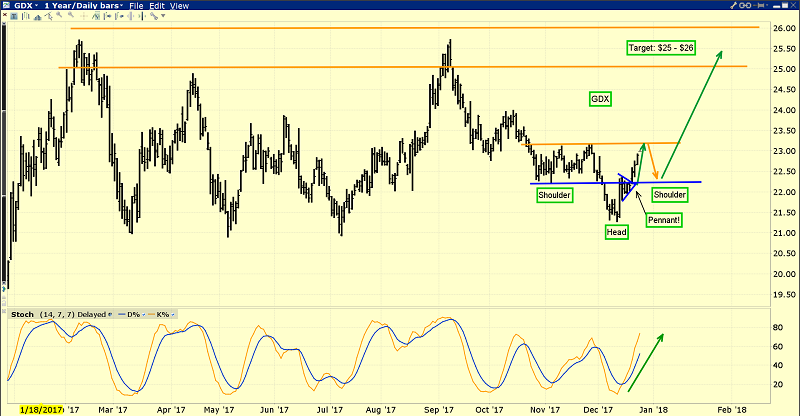 This is the GDX chart. GDX is sporting a great looking inverse head and shoulders bottom, and the rally from the head of the pattern has a bull pennant formation breakout in it. This is quite exciting. 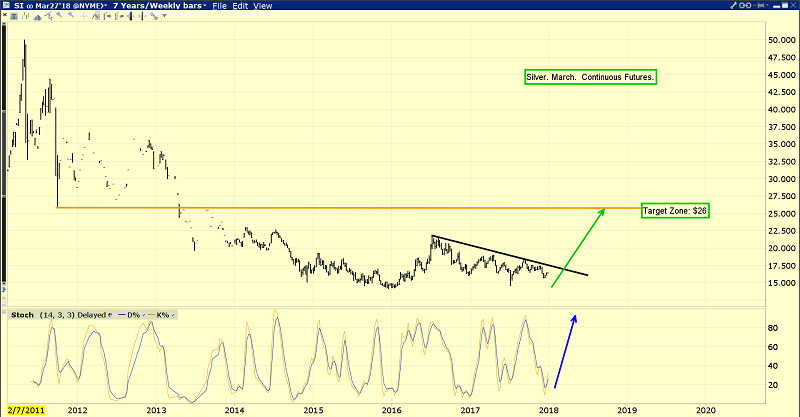 For gold stock investors around the world, it is really ushering in the New Year in a great way. I’ve suggested that the $25 - $26 target zone is likely to turn out to be little more than a pitstop on the road to the $35 area. I’ve argued that the biggest bubble of all time is the bubble of government fiat money, and that bubble has started to burst. The initial bursting of the bubble has seen all global fiat collapse against blockchain currencies like bitcoin. That’s a lot like how the stock market crashes when it becomes a bubble. The initial collapse happens in the most speculative stocks. From there, the collapse spreads to the big Dow Jones Industrial Average component stocks. In the case of the fiat bubble, I’ve predicted that the collapse of fiat against bitcoin is only the very beginning of a horrific collapse that will ultimately see fiat fall hard against gold, silver, and mining stocks. This is the exciting bitcoin chart. Technically, the double bottom pattern is arguably the most difficult one for investors to handle emotionally. A great double bottom appears to be in play now on this short-term bitcoin chart. Note the immense panic volume on the first low, and the much lighter volume on the second one. That’s classic technical action. There’s also a potential flag-like pattern in play, which is quite positive. A breakout above $15,000 is likely, and it would serve as a lead indicator for an imminent and powerful rally in the precious metal markets. The bottom line: gold investors don’t need to be invested in bitcoin, but it’s important to follow the price action as a lead indicator for the spread of the global fiat wildfire. Some heavyweight institutional analysts are concerned that a fall in bitcoin against fiat could trigger a stock market crash. Governments and central banks are becoming pushed into a corner. They need to quickly regulate bitcoin markets so that a rogue bank or other nefarious entity doesn’t try to cause a global markets crash by crashing bitcoin. 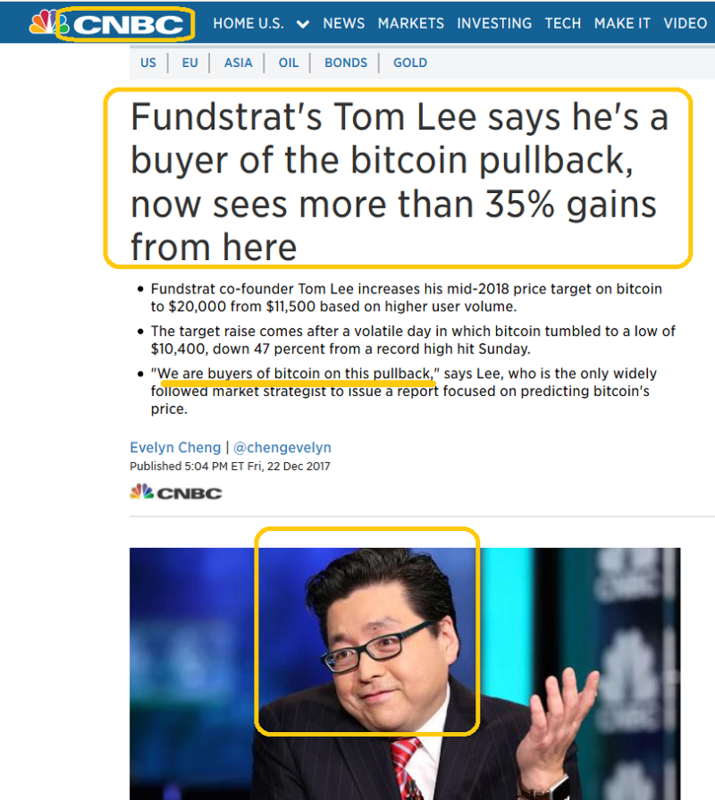 Tom Lee was head of equities for JP Morgan. He turned bullish on the US stock market at almost the exact low in 2009, and stayed bullish until 2016 when be saw the market as fully valued. He’s started his own firm now. He’s moved his focus to bitcoin and was an eager buyer on Friday, as I was. With heavyweights like Tom in the blockchain house, the global fiat fire is likely to intensify. This is the key money velocity chart. I think most mainstream analysts are underestimating the commitment of Trump and new Fed chair Powell to small bank deregulation. That deregulation can end the twenty-year money velocity bear market, and usher in an era of inflation. Hi ho silver! When inflation becomes widely accepted by institutional investors, they will flock to silver more than gold. This is particularly true if global growth continues. Watch for a trendline breakout fuelled by bank deregulation to send silver soaring to my initial $26 target, and on to higher prices after a brief rest there! Special Offer For Gold-Eagle Readers: Please send me an Email to freereports4@gracelandupdates.com and I’ll send you my free “Golden Rocket Man!” report. I highlight about eight key junior gold and silver stocks that could rocket 100% higher during the Chinese New Year season of 2018! I include precise buy and sell points for each of these great stocks.